MDM-1 [My Dear Malevich] (Group Show), Homage: Contemporary Art in Digital Media, Art Institute of California, San Diego, California, U.S.A., September 11 - October 15, 2010. MDM-1 [My Dear Malevich] (Group Show), Homage: Contemporary Art in Digital Media, Escondido Arts Partnership Municipal Gallery, Escondido, California, U.S.A., July 9 - August 21, 2010. The Homage exhibit engages viewers in unexpected ways. The allusions to masters of image making and allusions to cultural traditions will provoke the kind of conversation one would like to have at an inventive exhibition. As with any new vision, medium or style in art, there is an incentive to restart the conversation. Not necessarily that we arrive at a new type of art, but more to deepen our understanding of who we are, what intrigues us and what this particular artist or artists have to say with their imagery. The how they do their art is less important in some ways, especially when the how to is a material element in bringing forth the imagery. Well, what about contemporary art? One way into this conversation is to reflect on what moves a particular set of artists. 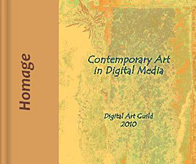 The Digital Art Guild is a loose confederation of artists who work in digital media - some extensively, perhaps with an algorithmic method; others post-process their photography in ways that may or may not coincide with photorealism; others draw and paint with digital brushes or bring in an image partially worked up with pencil, crayon or paint in the real world and then rework it as a virtual object; and other combinations of media that suit their particular craft. That is the methodology of these artists - distinct in some ways, but common in others, to artists who plied their craft in caves, churches and studios, whether indoors or outdoors, hanging from ceilings with delicate brushstrokes or perhaps throwing paint at canvas and massaging it with brillo or a cashmere sweater. 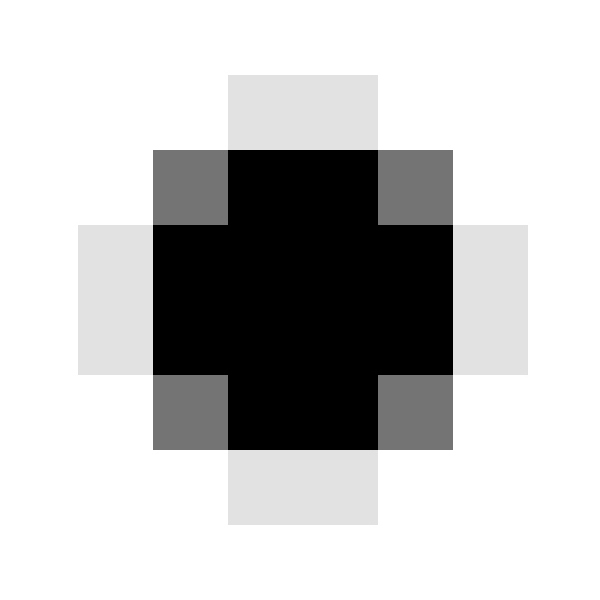 What it ought to be: It is the end image that counts as significant. The artists in this catalog took on the challenge of creating an image that revealed their approach to art. The challenge also came in the form of who or what inspired them - an homage to another artist, a school of art or to a cultural concept. Some adhered to a point of view, like Rumi's meditation with a mystic's perspective that helped decide what was the better art; others reinvented their beginnings by disputing the notions about what it means to be modern (as in, participating in contemporary society and not as a school of art) - that what is self-evident in art is what each artist makes of the enterprise rather than what a particular philosophy might impose. And not to lose an opportunity, I decided to inquire into imagined secondary conversations among these artists by juxtaposing their images as interesting pairings on opposing pages. Some would take issue with this approach, preferring to have each artist stand alone with his or her text adjacent to the image. On the other side of the argument is the possible loss of the mystery of the image by saying what it is too quickly; that can be left to the text section of the book. Instead, the way a curator hangs an exhibit or lays out a catalog is yet a further narrative about the intersection of artist, vision, style and the like. As an homage to my father, who was a savant about Shakespeare, I might best phrase this open framework for engaging with the art in this catalog by modifying a quote from Hamlet: "There are more things in heaven and earth - than are dreamt of in our philosophy."